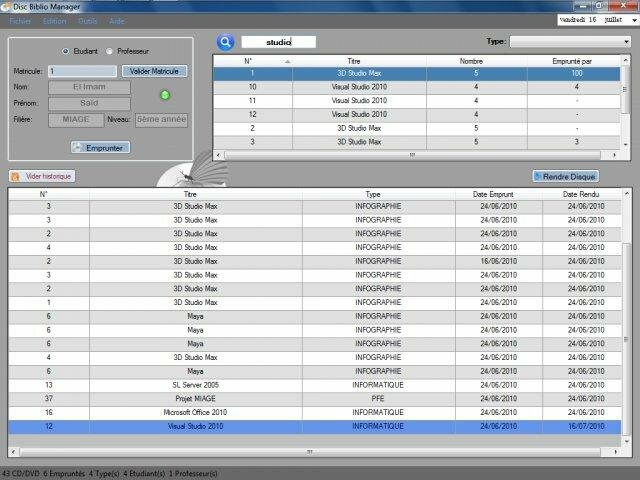 Disc Biblio Manager is an application, coded in Visual Basic .net, that manages a disc library of a school or an institution. It's 100% dynamic and stable, which may help schools and libraries manage their disc collections using this program to borrow them to students or subscribers. The user interface is very friendly, and fun to use. All functions are accessible in a logic way and inputs are managed smartly. That means that the application understands what the user is looking for, no need for him to precise what he seeks!